JRA Ritto Training Center. More Ritto photos here. Ritto (栗東市; Ritto-shi) is a city in Shiga Prefecture. Landlocked city in southeastern Shiga and best known for the JRA (Japan Racing Association) horse-racing training grounds and home base of Take Yutaka, Japan's winningest jockey. The city also long pushed to build a new shinkansen train station and even started construction in May 2007. However, the city was forced to cancel construction in Oct. 2007 when the prefectural government declined to support the project. Unlike her predecessor, Shiga Governor Kada Yukiko opposed the project, citing the prefecture's poor financial condition. Kada was elected governor in July 2006 promising to cancel such "wasteful" construction projects. The news made national headlines. Express trains do not stop at Ritto Station on the Biwako Line. You have to take a local train to reach Ritto. Feb. 3 - Setsubun bean throwing at Daiho Shrine. May 4-5 - Daiho Shrine Reitaisai Festival features tug of war and taiko performances on the 4th and portable shrine processions on the 5th. The tourist info booth in Kusatsu Station provides tourist pamphlets for Ritto. Depending where you want to go, you can take a train or bus. 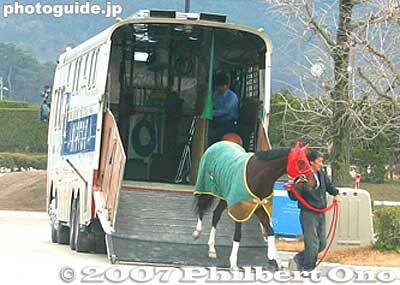 To visit the JRA Training Center, take a bus from Kusatsu Station on the JR Tokaido/Biwako Line taking 30 min. Ritto has two train stations. On the JR Tokaido/Biwako Line, take the local train to Ritto Station. Or from Kusatsu Station, take the Kusatsu Line to Tehara Station, the next stop. From Tokyo Station to Ritto Station: 140 min. via JR Tokaido Shinkansen Nozomi to Kyoto Station, then 25 min. to Ritto Station via Tokaido/Biwako Line. From JR Kyoto Station to Ritto Station: 25 min. via JR Tokaido/Biwako Line. From JR Maibara Station to Ritto Station: 40 min. via Tokaido/Biwako Line. From JR Kusatsu Station to Tehara Station: 5 min. via JR Kusatsu Line. Ritto Station (栗東駅) - Daiho Shrine is nearby on the west side of the station. Only local (futsu) trains stop at this station. Tehara Station (手原駅) - Station next to Kusatsu Station. Near Ritto City Hall and Mt. Anyoji. Also near the former site of the new Tokaido shinkansen station which was proposed to be built. More photos at Ritto Photos. More Shiga photos here. Videos of Ritto coming later. 2001 Ritto established as a city. 2005 Major business magazine publisher Toyo Keizai Inc. ranked Ritto as Japan's No. 1 Livable City, noting the city's safety, convenience, and pleasantness. 2007 The city's plan to build a new shinkansen train station in Ritto is canceled. Japan's most famous horse race jockey grew up in Ritto and commutes to the JRA Training Center from his home in Kyoto. Other sights in neighboring cities/towns within easy reach from Ritto. This page was last edited on 7 December 2018, at 01:40.